My most enduring images of California are fictional ones: Maria compulsively driving the freeways in Play It as It Lays; the snakes on the highway or coiled in the blanket of dead newlyweds or the rattlesnake in the playpen in the same novel. Joan Didion’s 1970 Hollywood novel captured, for me, the angst and despair that I always associate with the sunny carefree surface California tries – still tries – to project despite the earthquakes, landslides, droughts, floods, and fire seasons that are the inevitable nightmare of the West Coast dream. Didion, with her detached style, digs to the core. On my first and only trip to California – to L.A. for some auditions – it took over three hours for my hired car to get me from LAX to my Burbank hotel. The beautiful, marble-clad buildings of the complex are stately and dignified. Even though they contain art, they feel barren in their context. There are hazy views of the city and the mountains and a vista of the Pacific to the west. Sounds of water over rocks, down runnels, splashing in fountains are ubiquitous. After living in the desert of southwestern Utah, I learned to understand the Southwest’s obsession with water and fountains and found it magnified in L.A.
My lunch at the Getty Center restaurant included one of the best Cobb salads I’ve ever had. It was my birthday so I had a dessert. Throughout that Los Angeles trip, thoughts of images of travel forged in the wrought texts of Joan Didion were constantly evoked. The city was a reminder of Didion’s prose and of how that prose elicits a certain morbid fascination with California, even though the place holds no allure for me. Didion’s essay, “In Bed,” about dealing with migraines, has for some reason stuck with me ever since I first read it in The White Album in 1990. Then the pain comes, and I concentrate only on that. Right there is the usefulness of migraine, there in that imposed yoga, the concentration on the pain. For when the pain recedes, ten or twelve hours later, everything goes with it, all the hidden resentments, all the vain anxieties. I have occasional migraines. Because Didion wrote that passage, I associate migraines with California, too. The Year of Magical Thinking (2005), Didion’s most celebrated book of the 21st century, explores the nature of mourning and grief. It chronicles the year after Didion’s husband, John Gregory Dunne, dies unexpectedly. Before that book was published, Didion and Dunne’s daughter, Quintana Roo, died after an extended illness. Didion’s follow-up book, Blue Nights, focuses on Quintana’s death and expands on the themes of Magical Thinking. A couple of years after The Year of Magical Thinking was published, a friend notified me of the death of her husband in an email. In the subject line, she wrote “Magical Thinking.” I thought Has Didion now defined grief, too? Students tell me they plan to go to California after graduation. I say supportive things but I’m always thinking Why? Didion would say Why not? I never once planned to go to California. Despite spending much of her adult life in New York, Didion always identifies and is identified with the West and California. She attempts to define her California identity in 2003’s Where I Was From, a collection of essays which explores the dichotomies and complexities of the place. The first time anyone ever referred to me as an “Easterner” was on a trip to New Mexico in the 1980s. Prior to that I had only been called a “Southerner.” I remember that I was intrigued by the label and maybe a little pleased. Since then, I have realized that I am always most at home east of the Mississippi River. I will read anything Joan Didion writes. That point is driven home by the fact that I just finished her latest “book,” South and West: From a Notebook (Alfred A. Knopf, 2017), which is a very compact compilation of some Didion journal notes from the 1970s. South and West contains notes for stories that never quite came to fruition. “Notes on the South” is a document of a road trip Didion and Dunne took through Louisiana, Mississippi, and Alabama in 1970. “California Notes” is notes for a magazine piece about the Patricia Hearst trial but Patty Hearst is barely mentioned in that brief entry for a Rolling Stone article that never happened. I had only some dim and unformed sense …that for some years the South and particularly the Gulf Coast had been for America what people were still saying California was, and what California seemed to me not to be: the future, the secret source of benevolent and malevolent energy, the psychic center. Starting in New Orleans, Didion meanders, stops over in small towns, spends time in larger cities, doesn’t do what she planned to do, and doesn’t meet with people she planned to meet. For some reason, she couldn’t find William Faulkner’s grave in the Oxford cemetery where he’s buried. That perplexes me since I have visited that grave many times and it’s not that hard to find; I wish she had asked somebody for directions. A few black women were on the streets, and they carried umbrellas against the sun. It was almost five o’clock. In the middle of 22nd Avenue, the main street of Meridian, there was a man holding a shotgun. He had on a pink shirt and a golfing cap, and in one ear there was a hearing aid. He raised the shotgun and shot toward the roof of a building several times. The book presents “Notes on the South” as if the Zeitgeist-finding trip was never useful in producing a piece but it is surprising how much of that trip found its way – occasionally verbatim – into Didion’s 1977 novel, A Book of Common Prayer. That novel focuses on political upheaval in a Central American country, in the fictional Boca Grande, but much of the story of Charlotte involves semi-comatose road tripping through the American South and frequent references to an event that transpired at Birmingham’s Mountain Brook Country Club. In retrospect, “Notes on the South” is very present in A Book of Common Prayer. 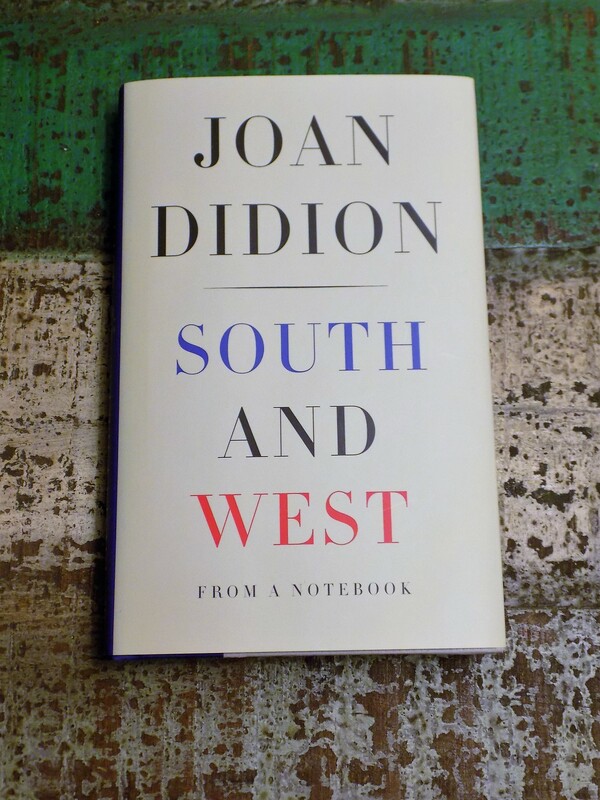 107 pages of South and West are devoted to “Notes on the South.” The final section, “California Notes,” is a scant thirteen pages which mention Patricia Hearst but focus on Didion’s reflections and impressions of growing up and her family and cultural history there. Some of the material found its way into Where I Was From thirty years later. Ultimately in “Notes on California,” there is a search for what “home” means. I am at home in the West. The hills of the coastal ranges look “right” to me, the particular flat expanse of the Central Valley comforts my eye. The place names have the ring of real places to me. I can pronounce the names of the rivers, and recognize the common trees and snakes. I am easy here in a way that I am not easy in other places. Through Didion’s precise, distant, dry, and often bleak prose, every place she observes becomes Didionland. This entry was posted in Joan Didion South and West and tagged A Book of Common Prayer by Joan Didion, American South, American West, California, Getty Center Los Angeles, Joan Didion, Los Angeles, Meridian Mississippi, migraine headaches, Patricia Hearst, Play It As It Lays by Joan Didion, Richard Irwin Central Garden designer, Richard Meier architect, The Year of Magical Thinking by Joan Didion, Where I Was From by Joan Didion on March 26, 2017 by gedwardjourney.